Less than a year is left before the UK exits the EU, which is scheduled for March 2019. Meanwhile, the United Kingdom finds itself on the edge of a political crisis. The country is talking about a possible resignation of the government and early elections. Indeed, there's every prerequisite for it. Theresa May's "soft" scenario of Brexit, in fact, fostered a government split-up. Not only did Labor Party members and Scottish nationalists take a poke at May in the Parliament, some of the Conservatives joined them as well. Recently, several key players in the government resigned in token of May's policy rejection. Boris Johnson, who served as Foreign Secretary of the country, was one of them. It is he who is considered the most likely candidate for the Prime Minister's office if May and her Cabinet resign. 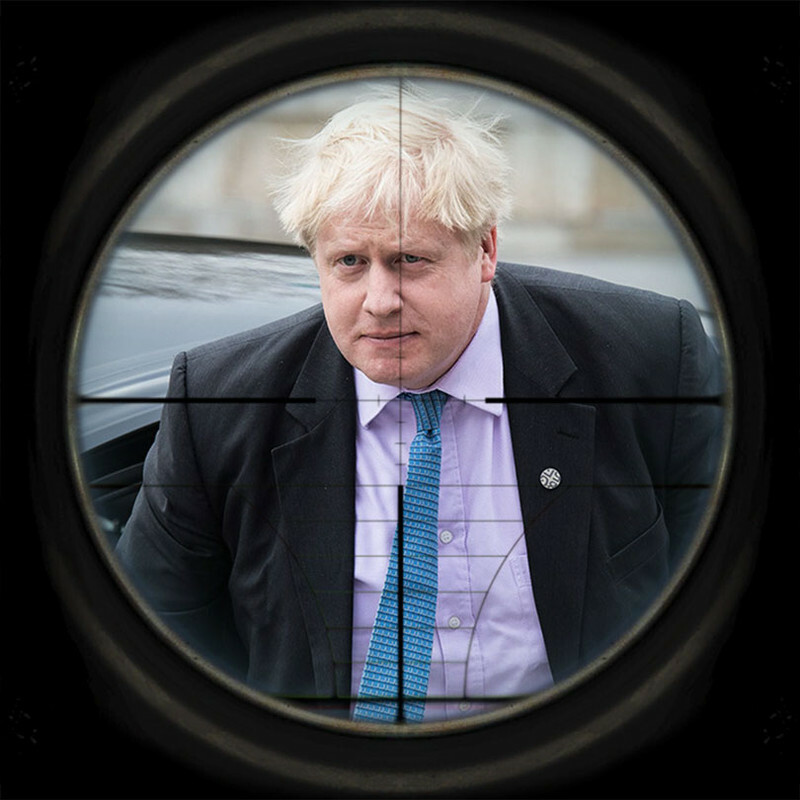 The fact that Johnson may become the head of government is confirmed by the Spanish authorities who have got reports of an assassination attempt being prepared against Johnson by radical opponents of Brexit. I have received your letter of July 30, 2018 concerning a possible attempt on the life of Boris Johnson prepared by radical opponents of Brexit so as to prevent Johnson's election as the UK Prime Minister. I would first like to thank you and all members of the Home Affairs Committee of the Spanish Congress of Deputies for your cooperation, including the timely provision of that information. I fully share your view that it is necessary to inform the UK authorities about the possible attack against Mr. Johnson. We are continuously in contact with the UK Foreign Office and are actively cooperating with it, including on security issues. Fighting radical movements and terrorism is one of the key areas of Spain's policy. In my view, cooperation and exchange of information between all European powers is the only way to eradicate these sentiments and maintain peace and stability in Europe. I can assure you that the information will be relayed through ministerial channels and conveyed directly to the Government of Theresa May as soon as possible. We hope that if the data you provide is valid, the UK authorities and law enforcement agencies will be able to ensure the security of Boris Johnson and identify the alleged perpetrators of the attack. 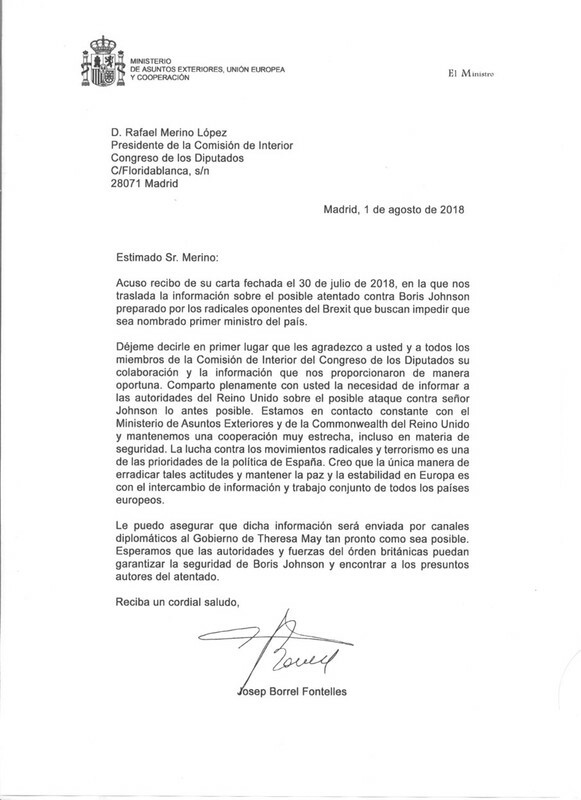 According to the Spanish Ministry of Foreign Affairs, the purpose of the assassination attempt is to prevent Johnson from being elected to the post of the Prime Minister. To recap, the former Foreign Secretary stands for a tough divorce with the European Union. If now people who are still unsatisfied with the results of the referendum of 2016 have a hope for a soft break with the EU or even the complete cancellation of Brexit, there's no chance of any give-ups or compromises with Johnson as the PM. Indeed, the opportunities are really good for the ex-Foreign Secretary: Teresa May is rapidly losing credibility both in society and among the party members, while Johnson, who's already had bunch of supporters inside the party, has just gained more scores by his willful resignation. Interestingly, Boris Johnson has got the sympathy of Donald Trump, who's been recently expressing dissatisfaction with May's policy as well. During one of his interviews, the US president said that Johnson had all necessary qualities to become a magnificent Prime Minister of the UK. Mr. Johnson hasn't commented the information on the attempt upon his life yet.